An historic building in Shrewsbury has opened to visitors following a two year restoration project costing more than �. 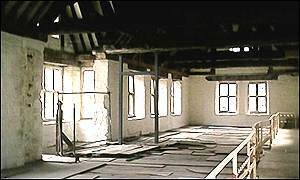 The Old Market Hall in Shrewsbury's Square will officially open as a Moving Image Arts Centre later in the year. Visitors will be able to watch live performances as well as events around the UK live on a web cam. But members of the Civic Society are opposed to the future development plan for the 400-year-old building which was once a trading centre for wool merchants and a magistrates court. Protestors claim it will destroy the building's historic character and are calling on Shrewsbury and Atcham Borough Council to halt the plans. Councillor Charles Armstrong said it was an exciting venture which would bring people to the town. "The building was practically falling down when we started the project and it had to be fully restored before any digital equipment can be installed. "The centre will be a launch pad for small film producers. "It involves film, video and digital media, and will be a huge attraction for the area." The centre, which will also have a cafe and an auditorium, will open in June.